Will GASB's New Rules Sink U.S. Pensions? Some U.S. public pensions, which lack savings for $1.4 trillion of promises to retired government workers, will record wider gaps in fiscal years starting after July 1 because of changes in accounting rules. Pensions in Illinois, Kentucky, Pennsylvania and other states will see funded levels decline, in some cases by more than half, as they comply with new Governmental Accounting Standards Board rules that for the first time will require future pension costs to be included on balance sheets and change how they must calculate their underfunding. The new rules won’t affect the amount that states and municipalities actually owe, though they could prompt them to address their underfunding, said Dean Mead, research manager at the Norwalk, Connecticut-based board known as GASB, which makes accounting rules used by most governments. The changes may force some states to cut borrowing or spending. A Hedge Fund Love Affair? Love ‘em or hate ‘em, the world of hedge funds is only getting bigger. The industry saw assets surpass $3 trillion in May for the first time ever. That’s according to hedge fund database, eVestment, which notes the new record exceeds the asset peak from 2008. It’s been a particularly strong year for hedge funds. In May alone, $22 billion of new capital was added bringing year-to-date flows to $93.3 billion. That’s the strongest start to a year since 2007. The industry’s growth is part of a larger trend since the financial crisis that involved hedge funds changing the way they ran their firms. 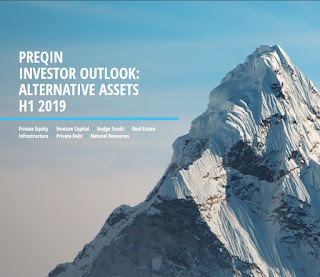 Before the crisis, many hedge funds left clients in the dark about their strategies and their overall approach to investing. 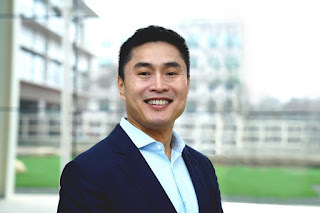 In those days, client simply shelled out a couple million dollars, received performance updates and paid their enormous 2 percent and 20 percent fees. Detroit's New Hybrid Plan Solution? 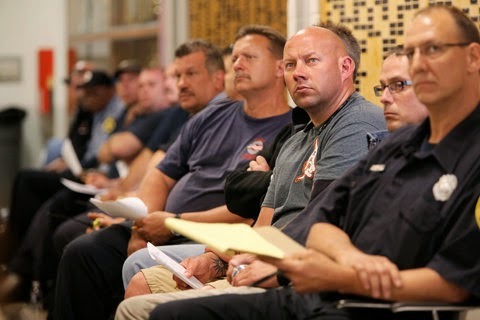 In the face of Detroit’s tumultuous bankruptcy proceedings, in which multiple parties are quarreling to protect their interests, the city and its unions have quietly negotiated a scaled-back pension plan that could serve as a model for other troubled governments. One of the most closely watched issues of the case is whether a government pension plan can be legally cut in bankruptcy. Detroit, saddled with a pension system it cannot afford, has introduced a new plan with the cooperation of its unions, which have been among the most vocal opponents of cutbacks. While both retired and active workers now participate in the same city pension system, the new plan is intended only for Detroit’s active workers, who will shift to it on July 1. Retirees will keep 73 percent to 100 percent of their current base pensions under the city’s proposal to exit bankruptcy. Alberta Investment Management Corp (AIMCo), the C$80 billion ($73.7 billion) provincial pension manager, is steering clear of investments tied to existing roads, bridges and transmission lines as their growing popularity squeezes returns. 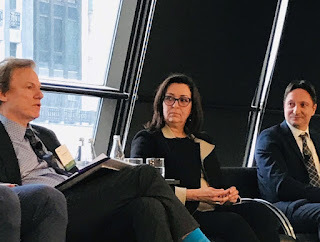 AIMCo Chief Executive Leo de Bever said on Monday the company is pushing into late-stage venture capital and newly constructed infrastructure as it looks for above-market returns for the pension and provincial government funds it manages. Investment in land or transmission lines "has become commonplace," de Bever told reporters. "The returns on it have started to diminish." Big Investors Missed Stock Rally? 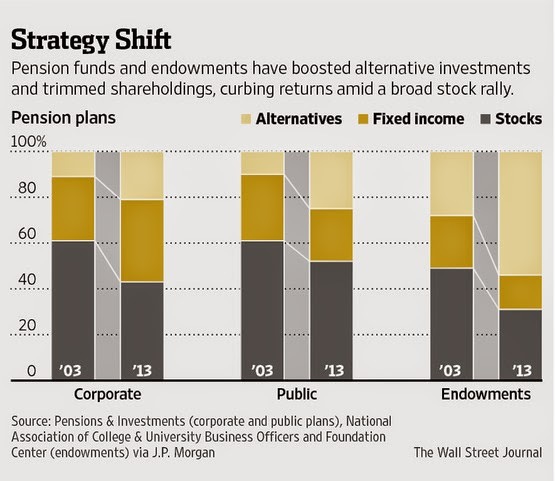 Corporate pension funds and university endowments in the U.S. have missed out on much of the rally for stocks since 2009, following a push to diversify into other investments that have had disappointing performances. The institutions, ranging from large corporations such as General Motors Co. to big universities such as Harvard, have been shifting to hedge funds, private equity and venture capital. 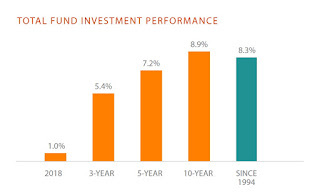 But while these alternative investments outpaced stocks during 2008's market meltdown and are seen as potentially less volatile, they have badly lagged behind the S&P 500 since 2009, a period in which U.S. stock indexes have more than doubled. British Columbia’s giant pension fund manager has named federal pension executive Gordon Fyfe as its next chief executive officer, saying it wanted a new leader with experience in global investment deals. 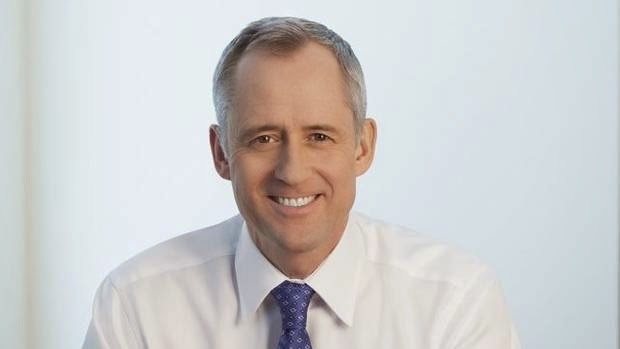 Mr. Fyfe, 56, has been CEO of the Public Sector Pension Investment Board in Ottawa for the past 11 years. PSP Investments manages $90-billion in pension assets for employees in the federal public service, and is Canada’s fifth-largest pension fund manager. He will move to Victoria to become CEO of B.C. 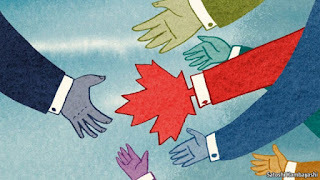 Investment Management Corp., which has $114-billion in assets and is Canada’s fourth-largest pension fund manager. BCIMC manages pension assets for public-sector workers in the province, and also oversees public trust funds and public insurance assets. The Soul of a Hedge Fund Machine? How do you build the world's largest hedge fund? 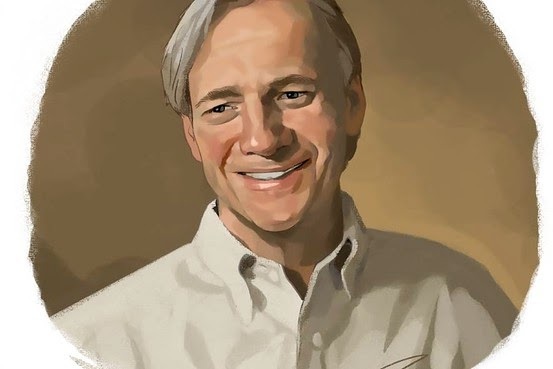 Bridgewater Associates founder Ray Dalio says he did it by creating a culture of "radical truth and radical transparency." Mr. Dalio's perhaps radical belief is that "everything is a machine"—including organizations and even the individual people within them. At his firm's Westport, Conn., headquarters, we are discussing the human machines at Bridgewater and the equally fascinating machine known as the U.S. economy. As for the people at his firm, the idea is to encourage everyone to accept unvarnished criticism as a treasured opportunity to learn and to solve problems. This is intended to allow constant refinement of business processes—also known as machines within the firm—from how Bridgewater buys office furniture to how it evaluates the world oil market. Time to Load Up on Linkers or Risky Stocks? Quebec's Declaration of Pension War? CPPIB's Struggle With Bold Investment Bets? The Secret Club That Runs The World? Goldman Stars Fall Back Down to Earth? CEO Pay Spinning Out of Control? Day of Reckoning Looms for Pensions?